Rev. Isaac W. Handy (far left) preaching to fellow prisoners at a Fort Delaware prison camp, circa 1863. In the mid-nineteenth century, theologians debated the scriptural justifications for or against slavery, and Presbyterians in America thought deeply about their own beliefs. The conflicts they faced would be magnified in the violent division of the nation, the Civil War. The Presbyterian Church in the U.S.A., after splitting into the Old School and New School branches in 1838, splintered further in 1861 over political issues, including slavery. "We are in the midst of one of those great moral earthquakes, so graphically described by our Saviour: there shall be distress of nations, with perplexity; the sea and waves roaring, men's hearts failing them for fear, and for looking after those things which are coming on the earth." 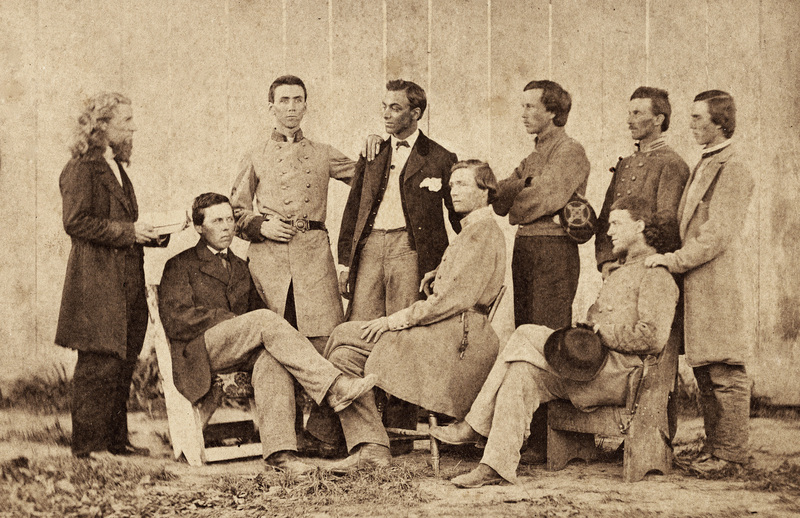 While the Civil War is an account of division on the one hand, on the other hand it is a story of Presbyterians coming together to care for soldiers and others directly involved in the war. Women and chaplains contributed much to the support of troops. Presbyterians additionally fulfilled their spiritual duties by providing assistance to freed slaves. "Presbyterians and the Civil War: Witnesses to a Great Moral Earthquake" uses sermons, manuscript diaries and letters, published materials, prints, and photographs to share the stories of American Presbyterians during this time of crisis. You can find more resources about Presbyterians and the Civil War here .